The International Test Commission (ITC) is a closely-knit community of researchers and field practitioners who share their work with one another, set up joint research projects and, perhaps most importantly, pool resources to define, streamline and promote best practices in testing. The ITC Guidelines for Translating and Adapting Tests lie at the heart of cApStAn’s work from the early days of PISA: the first draft of these ITC guidelines, by Fons Van de Vijver and Ron Hambleton, date back to 1997, and Aletta Grisay suggested we should use them for the PISA 2000 translation design. cApStAN participated in the revision of the Second Edition of the ITC Guidelines (2017), which are widely used and cited. 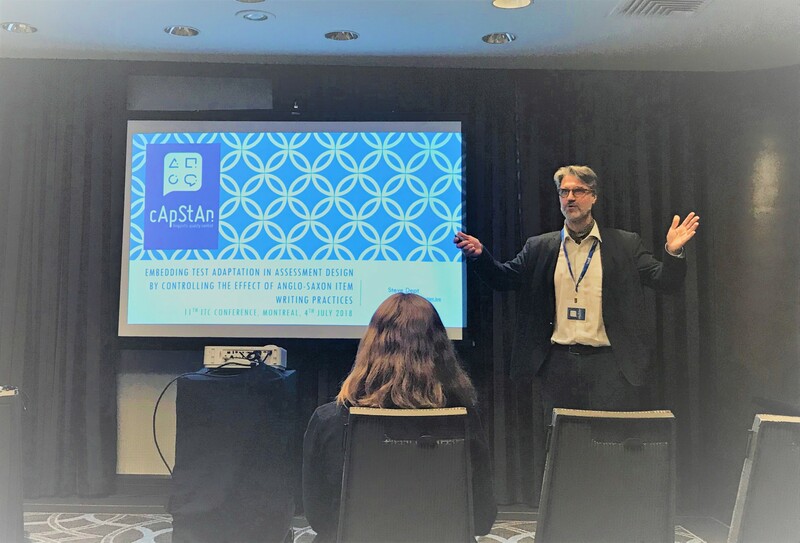 It comes as no surprise that cApStAn feels a strong bond with the ITC and it felt natural to support the ITC conference this year in Montreal (July 2-5, 2018). As platinum sponsors, we had a booth and attended with a team of four. What a vibrant conference! Over 400 attendees from over 40 countries, all involved in testing, measurement, psychometrics and, of course, test adaptation. We took turns attending workshops, symposia, keynote speeches, oral presentations, parties, and manning the cApStAn booth. The games we had prepared were an even bigger success than the maple sweets on offer: the sentence “Welcome to Montreal, city of celebrations!” was presented in 14 native languages of the cApStAn team. Farsi, Bengali, Nepali, Macedonian and Galician were the most difficult ones to guess. The top scorers received a hardback copy of the Wiley Book “Implementation of Large-Scale Education Assessments” (2017), edited by Petra Lietz, John Creswell, Keith Rust and Ray Adams, including a chapter on translation and cultural appropriateness of survey materials by Steve Dept, Andrea Ferrari and Béatrice Halleux. It struck us that the interest in cross-cultural adaptation of tests is more alive than it used to be, and that there is increasing awareness of the complexity of test adaptation. Presentations by numerous contributors showed that the era of literally transposing US or UK tests into other cultural contexts is over, and many research organisations have transitioned from back translation to more complex models of test adaptation. The presentations given by Marielle and Steve clearly resonated with the highly receptive audience. Several conversations have led to the beginnings of joint projects with researchers from different backgrounds; multidisciplinary approaches to test adaptation are on everybody’s lips and we have learnt a lot, and come home with food for thought. With new ideas to enrich our methodology, we are keen to set up the new collaborations that were initiated at the conference. Congratulations to Nathalie Loye and her team for the flawless organisation, and thank you to all fellow ITC members for their warmth, their enthusiasm and their creative ideas.